Chris McDowall is a very, very clever person. In addition to all the other cool stuff he’s done in the NZ data space, he has just released this post on taking the Maxx public transport data feed of movements over a day, and plotting it out on a map. It’s hypnotic and astounding in the sheer volume of movements – but you need to see it to appreciate how cool it is. An animated map of Auckland’s public transport network from Chris McDowall on Vimeo. Barcamp Auckland is an annual gathering of developers, designers, start-ups and social-media types. It’s a full day event held in an ‘unconference’ like style, where the attendee (see my attendee & interested folks list on Twitter) set the schedule – and people turn up to discuss topics which interest them. Session 5: What do you want from your Telco / Service provider? I found the talk to be somewhat disjointed, yet filled with amazingly wordy slides with paragraphs of text which may have reinforced a point if they had have been on screen long enough to read. It was always going to be tough to follow the first (very engaging) speaker â€“ however, with some practice, feedback and basic presentation learning under the belt, this could have been a lot better received – so I hope I am not seen as being too harsh in my summary. For another summary of the talk, click here to see what Missing Link said. 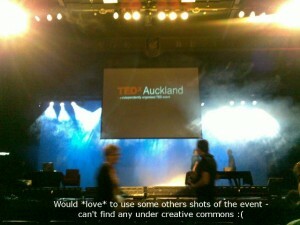 As I alluded in my initial TEDx Redux, the inaugural Auckland event was awesome. In the next three posts I will briefly cover my perspectives on the presentations delivered at this, the first TEDx event in Auckland, New Zealand. Executives go on a â€˜retreatâ€™ (never an advance?) then return to proclaim new company values to their employees. The interesting observation I made about his talk was that, not only was I noting the same points as one of my colleagues, these same points were also being noted by a number of other â€˜corporate typesâ€™ around where we were seated. TED. Three letters, a veritable treasure trove of new ideas, challenging thinking and incredible people with finely honed presentation skills. I first stumbled across the TED initiative in 2006 when I was shown a presentation by Hans Rosling using Gapminder to do some incredible data visualisations. From that day onward, they have been a regular both in my RSS feed readers and in my browser as I immersed myself in the site from which I have gained so much. It was with huge excitement then that I saw that TED was not only allowing independently organised events (under itâ€™s banner of TEDx), but one of these events was going to be in Auckland, New Zealand â€“ my home town. I must admit I was initially reluctant to fill out the registration form, as chest puffery and self promotion doesnâ€™t sit well with New Zealanders. Encouraged by some colleagues, and with the knowledge that the official event attendee spots are so coveted I did sit myself down and force my fingers to the keyboard to tap out an introspective view of what I have achieved to date, and why I should be amongst those fortunate enough to sit in attendance. The exercise in itself was worthwhile as it gave me an opportunity to cast back over many years in the technology industry, and to re-celebrate a number of the awesome innovations that I had been involved in over that time. The submit button was clicked, the â€œThank you for registeringâ€ page loaded â€“ and then all there was to do was wait. In the fullness of time, I received an acceptance email and, excitedly, I checked in with my other colleagues to find they too had secured their place â€“ timing-wise, the TEDx Auckland event was scheduled for the day before a weekend away at TelecomONE, a FOO style “Innovation Unconference”, so I knew that we would be in for one heck of a lot of brain stretching. We made our plans to meet up and attend together, and then again we waited for the beginning of the first ever TEDx Auckland, October 01, 2009. Keep up with the tweets surrounding the event here – and I’ll be summarising my notes over the weekend.